DULLES, Va.Dec. 1, 2017-- Orbital ATK (NYSE: OA), a global leader in aerospace and defense technologies, today announced significant progress on the National Oceanic and Atmospheric Administration (NOAA) Joint Polar Satellite System (JPSS) spacecraft program. The JPSS-2 spacecraft will host instruments that provide essential operational space-based weather observations for NOAA, extending the successful 50-year NOAA/NASA partnership into the next two decades. Representatives from NASA, NOAA and Orbital ATK recently completed a successful spacecraft Critical Design Review (CDR) for JPSS-2, which demonstrated that the program met all system and schedule requirements. Also evaluated was Orbital ATK s responsibility for integrating five government-furnished instruments, and supporting the launch, early operations, and on-orbit satellite check-out prior to handing operations over to NOAA. The successful conclusion of the JPSS-2 Spacecraft CDR marks a key milestone for the program and keeps the JPSS-2 spacecraft on track for an on-time delivery, said Steve Krein, Vice President of Science and Environmental Programs at Orbital ATK. While building a space-based weather observation satellite is a new mission area for us, it will be manufactured on a flight proven platform that demonstrates the success of Orbital ATK s current science and environmental satellites that already provide critical data to our customers. The contract with NASA was awarded to Orbital ATK for the delivery of JPSS-2 and includes options for two additional satellites, JPSS-3 and JPSS-4. The company is responsible for the design, manufacturing and testing of the JPSS-2 satellite which is scheduled to be completed in 2020 at the company s satellite manufacturing facility in Gilbert, Arizona. While Orbital ATK has manufactured a wide variety of Earth science, commercial imaging and defense satellites, JPSS-2 will be the first operational weather spacecraft produced by the company. The spacecraft is based on Orbital ATK s LEOStar-3 bus, a flight-proven flexible satellite platform that can accommodate a variety of missions, including Landsat-9 and ICESat-2, both currently in production by the company. Built to support long-life missions, this modular design incorporates improvements and upgrades from Orbital ATK's prior bus developments that resulted in numerous highly successful missions. 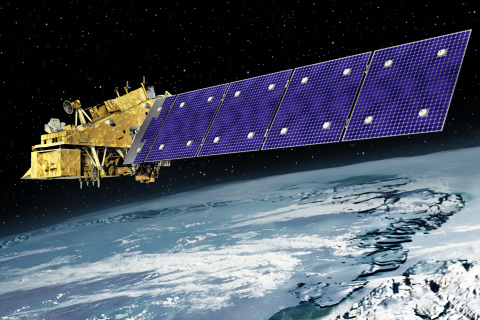 The JPSS-2 satellite will join a constellation of satellites, including the joint NOAA-NASA Suomi National Polar-orbiting Partnership (Suomi NPP) and NOAA s JPSS-1, which gather global measurements of atmospheric, terrestrial and oceanic conditions. During the required seven-year design life, JPSS-2 will deliver observations essential for accurate forecasting up to seven days ahead of severe weather like hurricanes, tornadoes and blizzards. The data collected will also be used to assess environmental hazards such as sea ice, floods, volcanic ash, wild fires and poor air quality. The result is timely and accurate public forecasts that reduce the potential loss of life and property and minimize economic impact around the world.